A mushroom that devours insects could assist the development of new medical drugs and pest-resistant agricultural plants. With the help of the Australian Synchrotron, an international team is revealing the deadly secrets behind the oyster mushroom’s ability to eat spiders and roundworms. These edible mushrooms contain a protein called pleurotolysin that can punch holes in cells. Our immune system uses a similar protein to destroy infected cells, cancerous cells, and bacteria. A scientific research team led by the ARC Imaging Centre at Monash University and Birkbeck College in London has published amazing details of how the oyster mushroom’s hole-punching protein actually works its devastating magic. 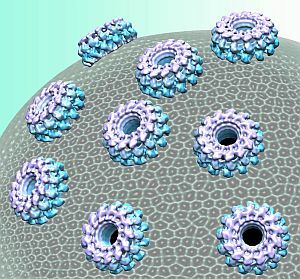 Using synchrotron x-ray diffraction, cryo-electron microscopy and computational experiments, they’ve shown how 13 protein molecules self-assemble into a ring that attaches to the membrane of their target cell. The proteins then unfold and extend downwards to puncture the membrane, leaving a tidy but deadly hole. Team member Dr Tom Caradoc-Davies from the Australian Synchrotron said the synchrotron was critical for solving the structure of the oyster mushroom proteins as they assembled and then refolded to punch a hole in their target cell. The structural information will enable scientists to pursue potential new applications that include stopping malaria from infecting the liver, and making it impossible for listeria bacteria to evade our immune defences.